Prime Minister Narendra Modi Tuesday slammed the Congress for being "soft" towards terrorism for 40 years and said India can now talk about peace after it exhibited the strength by destroying terror camps across the border. "No one had listened to India earlier when it pleaded for peace. However, now the entire world is with us after witnessing our strength. Only the strong and powerful can talk about peace. No one listens to a weak nation," Modi said. "If we display our courage, peace will prevail not only in India but in the entire sub-continent," he said asserting that BJP is keen to build a "new India" based on confidence and courage. Asking the crowds whether or not the armed forces be given a free hand to deal with terrorism, the prime minister said, "For 40 long years we had been tolerating terrorism and shedding tears. How long should we tolerate this?" Mounting a blistering attack on the Congress, Modi accused it of being a silent spectator to the loot of public money besides being embroiled in multiple controversies and scams before the BJP-led government put brakes on these corrupt practices. "During the Congress era, only 15 paise of a rupee would reach the poor and the rest was swindled by unscrupulous elements. No one bothered to stop it. Now, we have ensured that central funds reach the poor," Modi said. The Congress has lost credibility among the people as it has no mission and its leader (Rahul Gandhi) lacks vision, he said. "People are not angry with Modi or the BJP-led government. They are angry with Congress and its 'Mahamilawati' (highly adulterated) friends for their behaviour. They have been spreading lies and making false allegations," the prime minister said. "The party and its friends have only one agenda - that of 'Modi Hatao'," he said adding that the Congress can go to any extent for its vote bank. Maintaining that there is no dearth of resources, Modi said the previous dispensations never paid attention to proper utilisation of funds and natural resources, while his government has taken concrete steps for its optimum use. Seeking to reach out to farmers in western Odisha, the prime minister said his government has hiked the Minimum Support Price for paddy 1.5 times, but the state's BJD government failed to take proper steps for its procurement. Modi's statement was a counter to the recent claim by Odisha Chief Minister Naveen Patnaik that the Centre has no sympathy for the farmers of the state. Accusing the BJD government of failing to provide a complete list of farmers, the prime minister said only 8.5 lakh peasants of the state could benefit from the scheme in the first phase due to the state government's apathy. "We will also ensure that the farmers get the entire benefit without diversion by middlemen," he said. 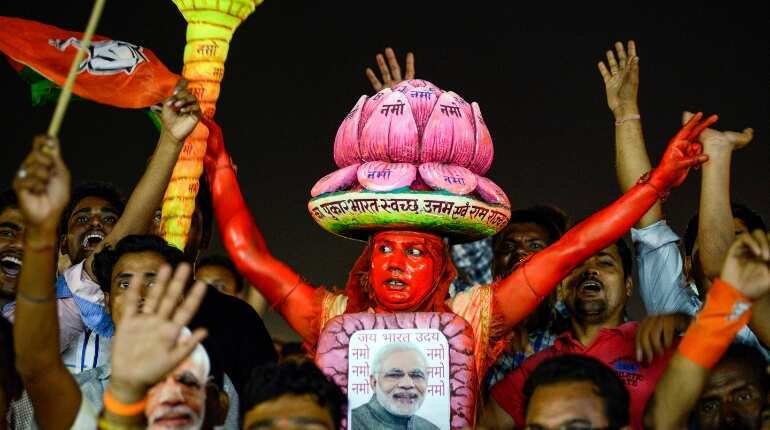 In a bid to woo farmers and the fishermen community, the prime minister announced that separate ministries of fisheries and 'Jal shakti' would be set up for their benefit, if the saffron party is re-elected. Modi alleged the BJD government was protecting those involved in mining and chit fund scam cases. Accusing the Patnaik government of betraying people by claiming central schemes as its own, the prime minister said the Centre's contribution in the much-trumpeted Re 1 per kg rice scheme in the state is a whopping Rs 29 to Rs 30 per kg. He charged the Congress and the BJD with discriminating between people on the basis of region and caste and claimed that the state remained backwards because of this approach. Claiming that the people of Odisha have been "blindly" electing the BJD to power for the last 20 years, Modi said the ruling dispensation needs to be replaced and people should elect a "double engine" government by voting the BJP to power both at the Centre and in the state for speedy development. Assembly election in Odisha is being held along with Lok Sabha polls in four phases.